While the rest of the country is stuck in the snow, Clearwater is about to get live on the sand. 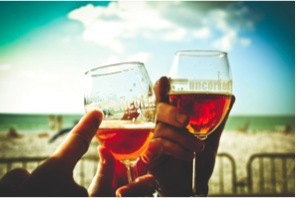 Clearwater Beach Uncorked, a Food and Wine Adventure is coming! For two days (February 8th and 9th from 1-5pm) Clearwater Beach is going to be turned into a wine-enthusiast and foodie paradise. The 3rd annual event will feature a Grand Tasting Village with unlimited sampling of world-class food, wine, and mircobrews, along with a Spirit Beach Club serving top shelf spirits, liqueurs, and novelty cocktails. Acclaimed chefs, winemakers, spirit producers, brew masters, and culinary experts will also be on the beach discussing dishes and drinks. It’s a can’t miss beach event sponsored by Bright House, the City of Clearwater, the Hyatt Regency Clearwater Beach Resort & Spa, and Publix Super Markets. Tickets include access to the the Grand Tasting Village, Spirit Beach Club, and the Uncorked Beach Club — located in a secluded area of the Hyatt overlooking the Gulf. If you opt to go for the Two Day Grand Tasting, you can make a weekend out of it. The Hyatt Regency Clearwater Beach is offering a an exclusive pre-Valentine’s Day VIP rate exclusively for guests of Clearwater Beach Uncorked. VIP room rates are limited so book early. A percentage of ticket sales from the event will benefit the University of South Florida School of Hospitality and Technology.